Singapore is land-scarce. Shelters for dogs are usually full to the brim. Dogs are taken in as quickly as volunteers get dogs adopted out, resulting in the existing residents of each shelter living in very close quarters. Out in the streets, stray dogs fend for themselves out in the open, away from anything remotely anti-bacterial, in constant contact with germs and viruses. There are no immediate, cost-friendly solutions to keep both sorts of dogs healthy except to vaccinate them. Vaccination is a $18-a-pop solution that keeps each vaccinated dog healthy for the next 365 days. During that time, they are kept immunized against infectious, deadly diseases like distemper and parvovirus. The $18 cost also includes dewormer for each individual dog, ensuring none die eaten out from the inside by hookworms. Vaccinating every dog is a logistical nightmare and a time-consuming process for just one organization alone. That's why this year, Causes for Animals (Singapore) are banding together with other shelters for the Singapore AWG Annual Vaccination Drive 2017. Our Vaccine Drive has expanded this year to help smaller rescue animals like cats and rabbits. We hope to keep these animals in foster homes and shelters happy and healthy too! ​This brings us to a total of 1000 animals! 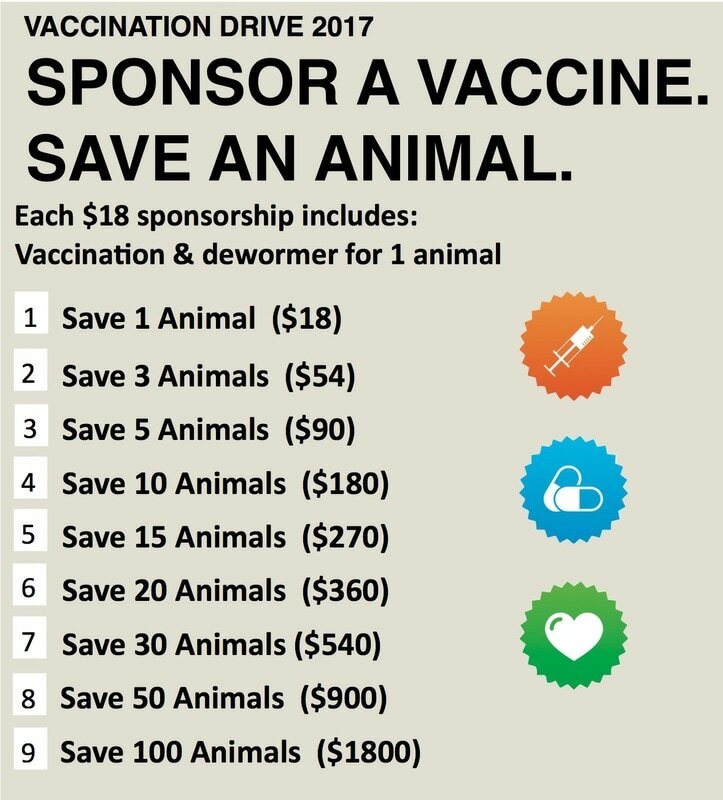 We can only get all these animals vaccinated with your help. Even if you sponsor just one dog, cat or rabbit that's one animal's life saved. The more vaccines we are able to purchase, the more vaccines we can give. The more lives we can save. Here are some of the shelters and rescue groups whose animals will benefit from this year's drive.